Night at the Derby | Junior League of Syracuse, Inc. The Junior League presents Night at the Derby as our annual spring fundraiser. Held each May, this event is a fun evening out with food, beverages, music, and games that have included a wine pull and silent auction. 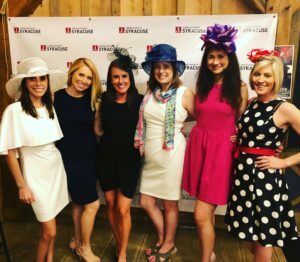 Proceeds from the Night at the Derby are used to support the JLS’ community impact and leadership development activities.We are excited to be planning our fourth annual spring fundraiser, Night at the Derby, on Saturday, May 4, 2019 at Sky Armory – featuring a Kentucky Derby theme, live music, and new games. Thank you to last year’s Corks, Forks, Brews, and Chews supporters!